Come take a stroll arm-in-arm with me through the finely laid out Spring gardens here at Chez Hoppo Bumpo. Over here we have our stone fruit orchard. What's that? Oh yes, I suppose it is a little unusual for an orchard to be a single fruit tree in a pot. Still, we are hoping for a bumper crop this year. Last year we clocked in at 6 plums, but to be fair most of the flower buds were blown off on the freeway. Re-locations can be so tricky in spring. Now on the left here, we have the citrus grove. Just wait til the summer. I have big plans for that lemon, I do. Can I make lemon curd with one lemon? What's that? The lime tree? Er ... nothing to see here; please move along. Over here on the table, we have our strawberry plantation (in original vintage pots). The leaves are looking a little yellowy-red, don't you think? Possibly a nitrogen deficiency. Hard to know the cause, unless you have a little background information. Actually,under the circumstances these plants seem to be quite robust. But I should say that aspirations for strawberry jam this summer might be a little lofty. Now straight on ... oooh what's that? Dehydrated. Red. Well blow me, I didn't know that was still alive. 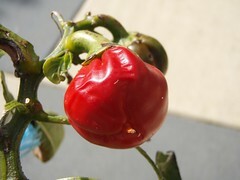 It will be perfect for antipasto - sun-dried capsicum, anyone? And finally, we have our blueberry patch. Yes, yes. I should say that it is unusual to be growing a blueberry bush in a 4 inch pot. But against the odds this brown twig seems to be flowering. Sadly once we factor in the elements, blackbirds and continued neglect, our super-food harvest will possibly struggle to qualify as either "super" or "food". Well, that concludes our garden tour. As you can see, if you arrive at this address and are reliant upon chlorophyll, you're basically a goner. I agree ... some people don't deserve plants, do they? Glad to see you are taking the water restrictions seriously! Thanks for a tour of your water wise garden. At least you can see them. Mine are hidden by the luscious, green, mass of tangled weeds. Pull the yellow leaves off your strawbs and then plant them out in a tub. You'll have strawberry jam in no time! at least you can laugh about it! Ahh but where there is life there is hope! Seriously, nothing there that a good slosh of charlie carp can't fix, that's my attitude to these things anyway! Way too funny. For some reason I can't see the images, but I gather from your tone and the comments that it's not all going to plan..
Wow! Your garden is just like mine. I have a single mandarin, a Blueberry stick just like yours and dehydrated capsicum too. Glad I'm not the only one. Oh, m'gosh!! How'd you get a pic of my strawberry plant?? Actually, that looks too healthy..can't be mine.